Friday’s Jobs Report for May ends a week filled with key reports. The packed economic calendar kicks off on Monday with Personal Income, Personal Spending and Personal Consumption Expenditures (the Fed’s favorite measure of inflation). Also on Monday, look for manufacturing news via the ISM Index. The ISM Services Index will be released on Wednesday. Additional reports on Wednesday include the Fed’s Beige Book and the ADP National Employment Report. Thursday brings Productivity for the first quarter and Weekly Initial Jobless Claims. Friday is the big day with the May Jobs Report, which includes Non-farm Payrolls, Hourly Earnings and the Unemployment Rate. 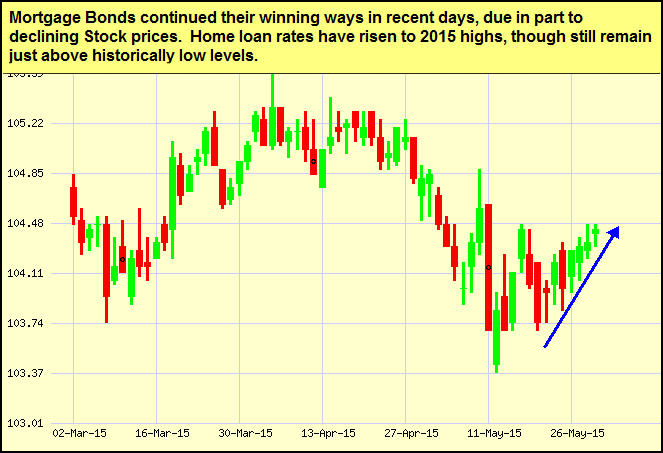 As you can see in the chart below, Mortgage Bonds have improved recently. Home loan rates remain attractive. Acknowledge the other side of the monitor. You’ve got an audience, so it’s not a good idea to eat, drink or multitask in any other way. In addition, looking bored or displaying other bad body language also shows you aren’t engaged. If you absolutely must make noise or have an off-camera discussion, don’t forget to mute yourself. Make sure everything works. Before your video conference, make sure your setup works properly with a test call so you can troubleshoot any issues ahead of time. Pay particular attention to volume, as you don’t want to sound too loud or too quiet. Watch out for delays. Internet connections don’t always cooperate, so be aware of any speed delays. If you notice people talking over each other, let everyone know there’s a delay and lead the conversation to make sure no one misses important information. Be on time and don’t go over time. As with face-to-face meetings, this is always an important business etiquette rule to follow.